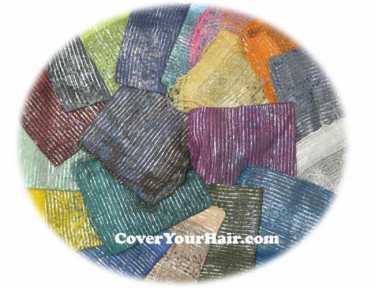 I am so happy to be able to show y’all some more terrific products from CoverYourHair.com. I love the wide selection of items available on their site. I received three items for review. Let’s check em out. This is a truly beautiful tichel. The addition of silver lurex stripes gives an elegant look. I love the addition of delicate fringe to the edges. This is a multipurpose piece. I love going to Renaissance Festivals and have seen many costumes that this could be part of. A must have. Tichels also known as Mitpachat are made from cotton and are 36 inches square. What a fun, youthful design. Elastic helps make sure headband fits perfectly and stays where you want it. A great addition to anyone’s headband collection. 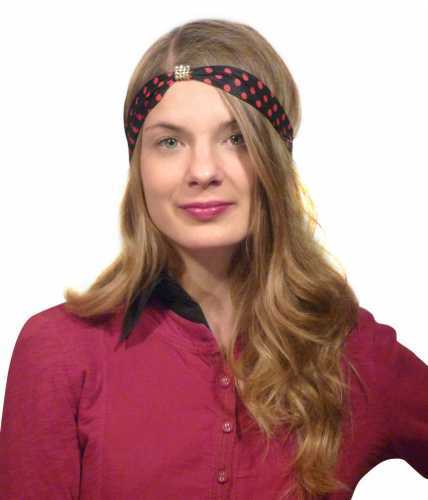 This headband has a center decorated with beautiful Rhine stones. Its really elegant on, but the polka dotted look gives it a very fun twist. I love this hat. Has the perfect fit to keep you warm this winter. Fabric is quilted so it keeps your head nice and toasty. Elegant looking with numerous styles of apparel. This Warm Winter Bucket Hat with Faux Fur is warm, comfortable and very fashionable. One size fits most. Enjoy the color that fits you the best. Want to keep up with all things CoverYourHair.com? You can like em on Facebook and follow em on twitter. Ready to buy? Head on over to CoverYourHair.com and get ya some of these great products. I got a chance to try OraMD The Mouth Doctor from Trusted Health Products. OraMD is an all natural liquid 3 in 1 Toothpaste, Mouthwash and Breath Freshener. Now that kind of combo is going to save you some money. I have to say the first time I used it the taste was a little overpowering. The second time my taste buds were ready. I actually got to where I enjoyed the super fresh flavor. OraMD is made from Almond, Spearmint and Peppermint oils. These contain natural antibacterial properties that help keep your mouth healthy and your breath fresh. What I really like is how smooth and clean my teeth felt after brushing, flossing and rinsing with OraMD. You know how nice your teeth feel after a good cleaning at the dentist. that’s the kind of clean feeling I am talking about. OraMD uses 100% pure ingredients that are Non-GMO. I like that it is made right here in the USA and is safe for children over the age of three with no allergies to peppermint spearmint or nuts. What makes Trusted Health Products different : Their products are made from 100% pure ingredients with absolutely no preservatives, artificial flavors/sweeteners/colorings, synthetic ingredients, gluten, yeast, binders, fillers, GMO’s or any other additives of any kind. Your body will recognize our ingredients as beneficial nutrients, not as added chemicals or poisons. The folks over at Trusted Health Products want you to know how toget the best possible results from using OraMD, Make sure to follow their simple 5 Step Oral Hygiene Program: BRUSH, FLOSS, RINSE, REFRESH, and FOLLOW UP. · Step 1 – BRUSH twice a day in the morning and evening by dropping 2-5 drops of OraMD on a toothbrush (without toothpaste), and brush normally. · Step 2 – FLOSS every evening after brushing – more frequently as needed. Get any food particles out from between teeth. · Step 3 – RINSE using OraMD as mouthwash twice a day: morning and evening. Just put 1-2 drops into an ounce of water, swish and gargle. This is important to kill the bacteria in the entire mouth including the back of the tongue. · Step 4 – REFRESH Mid-morning, mid-afternoon and as needed: drop 1-2 drops on the tip of your tongue and then roll your tongue around your gum line, teeth and walls of your mouth to kill bacteria and keep breath fresh. Care Instructions: Avoid Eye Contact, Do not swallow, Do not use while pregnant or breastfeeding. · Step 5 – FOLLOW the oral hygiene instructions provided by your dentist and hygienist, and have regular dental cleanings and checkups. Taking these simple steps each and every day will empower your mouth to fight bacteria, plaque and tartar, eliminate bad breath, and create an environment that promotes healthy teeth and gums. Remember, OraMD works much better and costs lesscompared to toothpaste and mouthwash…without the chemicals. Ready to Buy? Head on Over to Trusted Health Products and get you some.